Whenever I encounter someone who tells me they don’t like Chardonnay because they don’t like big, buttery, oaky white wines, I want to (and usually do) say "But have you tried Chablis?" Chablis is none of those things. Wines from Chablis tend to be lean, mean, minerally machines. Well, they’re not all mean — they’re also often very elegant and extremely refreshing . . . but they also taste like a few rocks and shells got mixed in. I tend to want to drink Chablis when the sun is shining, ideally with a big plate of oysters and other raw bar treats. However, my guess is that those sunny, shiny days are few and far between in this area of northeastern France where it gets quite cold. I’ve never been myself, but a few years ago I read an article called "In Chablis It’s Called 'Rock Juice'" by Adam Leith Gollner in Saveur that really painted my image of this region. Gollner describes it as "a rainy, cold, hardscrabble place where it often seems that villagers would prefer if outsiders stayed away and let them craft their finicky, terse wines in private." I think this piece has stuck with me for so long because Gollner takes me on EXACTLY the trip that I specifically would want to go on. He visits the winemakers of the region (including some pretty legendary figures — he starts at the door of Jean-Marie Raveneau) to taste their wines with them and get their pairing suggestions. He has ulterior motives though; he’s trying to get himself invited to dinner. Being suspicious of strangers, most of them initially treat him like he’s un petit fous. However, he says, "the Chablisians may be taciturn, but they're also profoundly kind-hearted and close to the earth." To give you an idea of the personalities we’re dealing with, there’s a humorous scene between Marie-Clotilde Dauvissat and her husband Laurent Tribut. When he can’t take a compliment she admonishes him, "I'm offering you flowers . . . It doesn't happen often. You should take them." Gollner is eventually able to find the chinks in the armor of the Chablisian winemakers enough to get several invitations to dine to varying degrees. He gets to join in on a few homemade meals, as well as snacks and smaller meals like gougères, crunchy bread and truffle butter, decadent scrambled eggs loaded with more truffles, and guac with chips. This is a hero’s journey that I really could see myself at the center of. Chablis is subregion of Burgundy in NE France. It’s a bit removed and farther north from the rest of Burgundy. This area puts its own spin on it. Even when compared to other parts of Burgundy, wines from Chablis tend to be leaner. They're also generally not oaked. Stainless steel tanks are typical fermentation to enhance the crisp minerally style. Some use neutral barrels that do not give off any oaky flavor. When they do use oak (which is more likely at the high end Premier and Grand Cru levels), it tends to be moderate and well integrated. You'd be hard-pressed to find an "oaky Chablis." They have a cool, semi-continental climate. This factors into the style as the chilly conditions lead to high levels of acidity. Feel your mouth water! Chablis is famous for Kimmeridigian as well as Portlandian soils. These crazy old soils have remnants of fossilized oyster shells leftover from an ancient, long-gone sea. These also factor into the style of the wines here, since they lend a particular minerality to the wines. One sip is all it takes to realize that terrestrial constituents seem to have infused themselves into the wine like finely flavored microscopic particulate matter. Picture a sprinkling of moon dust in your glass. It's the opposite of ripe, oaky, in-your-face California chardonnays. Chablis carries the memory of glaciers. That oceanic stoniness is the ideal complement to raw oysters. Image borrowed from Saveur. Photo by William Hereford. As you might of guessed, I recently revisited this article. 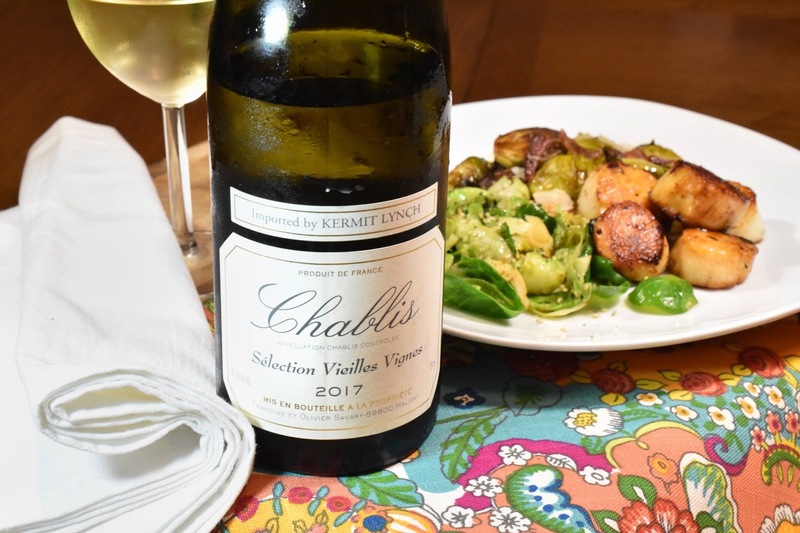 The French Winophiles (#Winophiles) are exploring Chablis this month (see the invite post here and scroll down for the rest of the group’s offerings) which inspired me to go searching for it again. It’s stuck with me all this time, so I thought I’d finally try one of the recommended recipes. I lucked out –– we even had a wine from one the winemakers featured in the story at Bay Grape. I happily grabbed the Francine et Olivier Savary Chablis Sélection Vieilles 2017. Olivier Savary and his wife Francine have been working in the area since 1984, and Olivier’s winemaking lineage goes back further through his family. However, there were no vines or winery waiting for him to takeover. Nonetheless, Olivier decided to go to Dijon to study winemaking. He and Francine started out as sharecroppers, along with some help from Olivier’s father as well. When they started out they would sell their fruit to a négociant. After they’d cut their teeth in this way for a bit, they started bottling and selling their own wines. Today, their sons Maxime and Mathieu are part of the family business as well. The wine was really fresh and light on the nose on the day Greg and I opened it, with notes of citrus, stones, and mixed green and gold apples. It was rounder on the palate with gold apples, lemons, and chalky sea minerals on the finish. There’s plenty of acidity here, but it’s not as crazy searing as it can be on some Chablis. This one’s on the juicy side. Very refreshing! I think this would be a very crowd-pleasing Chablis. A recipe by Margaux Laroche of Domaine d'Henri from the article for Seared Scallops with Steamed Brussels Sprout Leaves doused with soy sauce and ginger caught my fancy. However, I also REALLY love the combination of brussels sprouts and bacon. I wanted to try their way, but also really wanted mine too. I decided to do both! Definitely not a bad move. It’s always fun to compare and see how a wine changes with different flavors. The scallops were an easy match for the wine. All good things there. As for the sprouts, each version brought out a different side of the wine. With all the umami from the soy sauce and ginger, the recipe from Saveur brought out the umami notes in the wine and showcased it’s seashell minerality. On the other hand, since this Chablis was on the rounder side, it also worked really well with the smoky bacon. This brought out the juicier aspect of the wine. I was really torn between the two, although Greg very slightly prefered the bacony version as a match. Take your pick! These are both really good matches. In the story, Gollner enjoys a dinner of Chablis-style Ham with Tomato Cream Sauce with Francine and Olivier Savary. I will absolutely have to try this in the future. 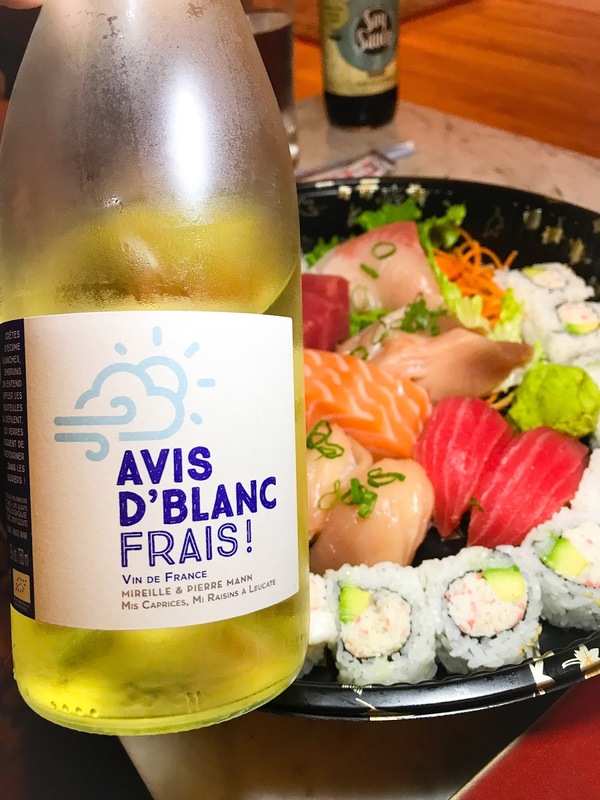 In addition to the pairings suggested above, the article also mentions how well Chablis goes with sushi. I’ve definitely taken this suggestion to heart and tried it over the years and it really does work quite well. If you’re looking for other wines to pair, most minerally white wines should work well here. Muscadet and Sancerre (or other another Sauvignon Blanc from the Loire Valley) would be good alternative options. 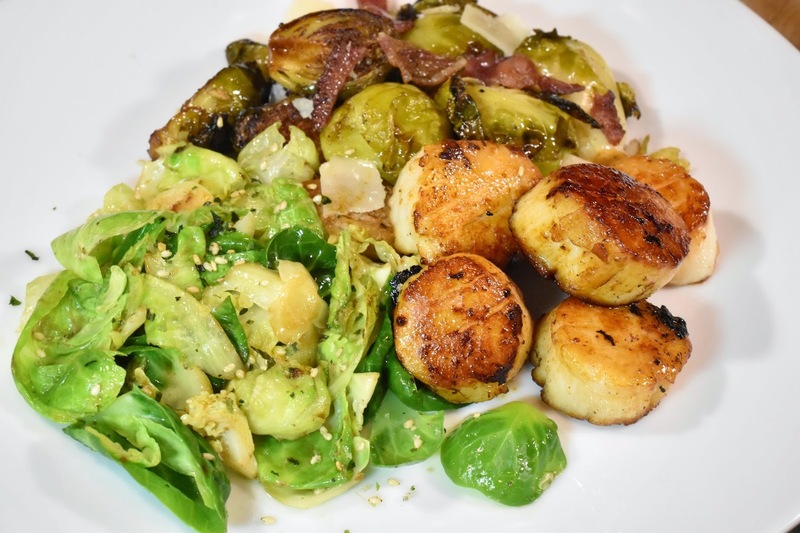 The brussels sprouts made with bacon could also handle wines with a little more fleshiness to them as well. Or try this clam and burrata pizza I also paired with a Chablis. Taken from the Kermit Lynch Website. • Average age of vines: 35 years old. • Soil type: Kimmeridgian Limestone. • Vineyard size: 3 ha. • Alcoholic and malolactic fermentation occur in 20% neutral oak barrels and 80% in stainless steel. • Wine is aged on fine lees. This wine retails for $31 at Bay Grape. I think that a very solid value for this approachable, yet classic wine that’s very representative of the region. I wanted to cook the scallops and ½ the brussels sprouts in bacon fat, so I’ve included them here as part of the same preparation and have included the second preparation for brussels sprouts separately. Refer to the Saveur recipe here to see a version of this preparation in combination with the scallops. It’s easy to see buzz words like organic, biodynamic, and natural wine and get completely overwhelmed. They all have different meanings, and it can all get REALLY confusing. I realize wine in general is itself already intimidating to most people, then you add in all this terminology and it can make you want to run and hide. You can write entire books on the subject of organic, biodynamic, and natural wines. Many have. Bay Grape recently did a whole class series on this. There’ve been panels and podcasts and articles, but it can still use further demystifying, so I’ll add another drop to the pond and try to clarify these and some other related terms. It’s Earth Month after all, so now seems like a good time. I originally intended to attempt to do some of this clarifying while I was writing my recent post on the Marcel Lapierre Morgon, as the Lapierre wines bring together a lot of the concepts together. I soon realized that I needed to move the defining to a separate post. It’s a lot. This also gives me a chance to share some of my own thoughts, so this post has also turned into a bit of an op-ed. However, I fully leave it up to you to decide what selections make sense for you. You might decide it’s not worth effort at all, but so many of us are son conscientious of what we put in our bodies and how it affects the world around us, that it seems worth considering the wine we drink as well. To start, I’ll summarize some of the key terms that are often used when discussing environmentally conscious wines. If you want more, this article from Eating Well gives a good overview. For an even deeper dive, check out this article on GuildSomm, and as always, I will drop in a few more resources throughout and at the end. This method focus largely (but not completely) on the farming practices and soil health. Grapes are grown without the use of synthetic chemicals—fertilizers, herbicides, fungicides and pesticides. Biodiversity is encouraged, so the soils are teeming with life like worms and insects, some of which are beneficial. Cover crops are planted to increase the nutrients in the soils. As a result, vines grow stronger and are more resistant to diseases. Use of the term “organic” in labeling is regulated. There are several organizations that handle certifications, such as ECOCERT in Europe, which is a three-year process. Things get a little bit confusing in that you can have wines made from organically certified grapes and wines that are organically certified themselves. In the first case, 100% of the grape used must have been grown using organic practices and the wines are allowed to be labeled “wine made with organic grapes.” Other ingredients, such as yeasts, used during the winemaking process don’t have to be organic, but must comply with certain standards. Organic wines go further, looking at both practices in the vineyard and the winery. In this case, all Ingredients that go into the wine, such as yeasts, also have to be certified organic, and any other non-agricultural ingredients must comply to their standards. In addition, while sulfur dioxide (sulfites) are naturally created in the winemaking process, no sulfites may be added to organic wine. In the US, certification for organic wines is handled by the USDA. Gulfi Nerojbleo Nero d'Avola Sicilia 2015 is made with organic grapes. The wine is medium bodied but has some grip, with smoked, red fruit notes. Mas de Gourgonnier has been practicing organic farming in Provence for a very long time. They were one of the first winery’s in Provence to get certified in the 1970’s, which was way before it was cool to so. I get this Mas de Gourgonnier Les Baux de Provence with some frequency since it’s usually just under $20. I’ve paired it with a Lentil Soup on NibblingGypsy.com and most recently with Lentils with Sausages and Arugula in an 8 & $20 for WineSpectator.com. This is basically organic farming with an added dose of mysticism. Biodynamic wines follow all of the requirements of organic wines, plus some or all of the teachings of Austrian philosopher and social reformer Rudolf Steiner. These were later refined by agriculturalist Maria Thun. This is a holistic approach to farming first laid out by Steiner in the 1920’s and looks at the whole ecosystem of the farm. In addition to farming without chemical fertilizers and pesticides, biodynamic farming also involves planting, sowing, pruning, harvesting, etc according to the phases of the moon and alignment of the sun and planets. Additionally, certain preparations are made and used in farming. The most famous of these is probably preparation 500 which involves filling a cow horn with manure and burying it in the vineyard over the winter. Like a lot of things that involve an element of mysticism, it's not quite certain why some aspects of this work, and yet they do seem to make a difference. Use of the term “biodynamic,” like the term “organic” is regulated in labeling. Organizations like Demeter and Biodyvin oversee the certification of biodynamic farms and vineyards. Organic certification is a prerequisite for biodynamic certification. Domaine Comte Abbatucci takes their biodynamics very seriously, following even the most far out practices. Their Cuvée Faustine Rouge 2017 is a delicious blend of Corsican varieties and shows concentrated strawberry notes balanced with lots of minerality. This translates to the “reasoned fight.” Growers using this style of viticulture use chemicals less often and aggressively than those practicing conventional farming. In a lot of cases this looks a lot like organic farming, but they’re basically leaving the door open to use a fungicide or pesticide if really needed. As an example, in my last post I mentioned that Passopisciaro essentially works in a lutte raisonnée style. There is no regulation around this term, so there is the potential for abuse. This is a completely unregulated term and its exact meaning can be hotly debated. To many, it’s the strictest of the terms since it goes further than the farming focus of organic and biodynamic practices. The standards and philosophies of natural wine are all self-imposed and many producers adhering to these ideals hold themselves to very strict, high standards. Others see natural wine as more of an umbrella term that encompasses all of these other terms. Discussions can get heated. Many are now turning to the term “low intervention” wines to indicate the lack of manipulation and chemical additives without all the drama. 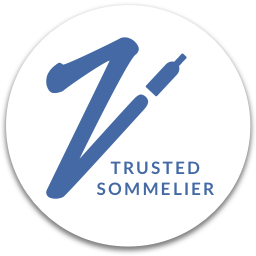 While it’s an unregulated term there are organizations that publish unofficial definitions and codes of practice such as the l'Association de Vins Naturels, Vinnatur, or Simbiosa. Aside, I love this analogy on GuildSomm drawing the distinction between organic, biodynamic, and natural wines by comparing them to chickens. 1. Go to Whole Foods and buy the very best chicken they have. It will be corn-fed, free-range and it will taste great. This is organic wine. 2. Search out a local butcher, the best you can find, and buy his most expensive chicken. It will be corn-fed, free-range, and coming from a small farm—the feet and head are still attached. It tastes fantastic. This is biodynamic wine. 3. Raise your own chicken, kill it, pluck it and eviscerate it. Then spit-roast it on an open fire. If you have some chicken skills it will taste amazing. If not you risk salmonella, chewing on feathers and your friends thinking you are bonkers. But you won't care and will still insist it’s the best chicken ever. We’ve talked a lot about farming and soil health. Sustainability, however, encompasses much more than that, taking a look at all inputs that are being used in the vineyards and in the winery including water and energy usage, waste and waste disposal, among other things. You could have, for example, a wine that completely adheres to organic practices, while still being lax in their energy use. 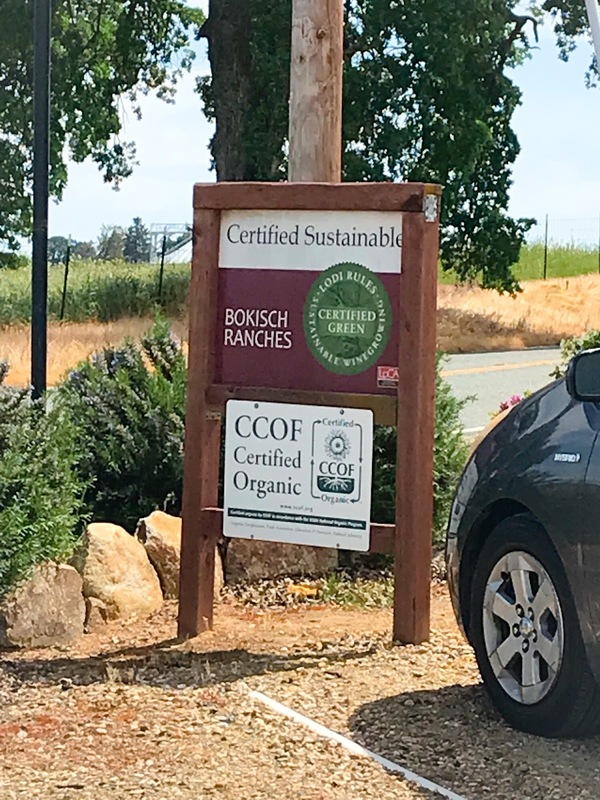 There are a lot of organizations that handle sustainability certification on a regional level, such as Napa Green or Lodi Rules here in California. There are also wineries, like Arnaldo Caprai, which I discussed in this post, that have spearheaded their own sustainability initiatives, which might not be specifically organic/biodynamic, but take those practices into consideration in combination with others. Bokisch Vineyards in Lodi, California is certified sustainable by Lodi Rules, as well as being certified organic. No animal products are used in the production of the wines. You might be like ‘What? I thought all wine was vegetarian!' There are actually some ingredients used for fining and clarification that are not — the most common is egg white, but there are others. In addition, wines that are strictly adhering to vegetarian/vegan guidelines also take into consideration all aspects of winemaking, including the packaging. For example, the adhesive used to stick a label on a bottle would have to be compliant — not all glues are. Proudly Vegan wines fit fully into vegan standards. 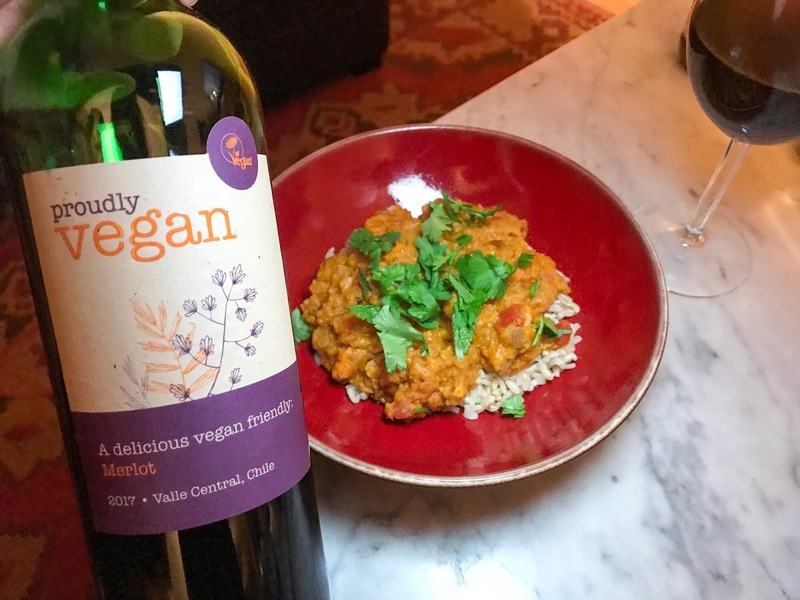 I paired this smooth Merlot with a sweet potato and red lentil dal. Recipe by Nigella Lawson for NYT Cooking. No irrigation has been used in the farming. Whatever nature provides, that’s what the vines gets. Proponents say that vines farmed this way are stronger and have roots that tap down deeper into the ground to reach water sources. Of course, this means that vines might be at risk in the event of a drought. The flip side is that vines that have been dry farmed in the past are also better able to handle drought conditions, like we had here in California just a couple of years ago. My understanding is that young vines can struggle a bit with dry farming, but after a few years, once they’ve been able to develop those roots, they become more resilient. Yeasts for fermentation can be purchased. There are also many yeasts already present already in the winery. Different yeasts perform differently and can create different flavors. Those practicing native/natural yeast fermentations are letting the yeasts that are around in the winery do the work. Many believe that these yeasts are a part of the terroir, so using them in the fermentation is a better reflection of that terroir. The downside is that native yeasts can be unpredictable in how they perform and can even cause off flavors. Sulfur dioxide has been used as a disinfectant, antioxidant, and preservative since Roman times. It’s used in many different foods, not just wine. It’s also created naturally in the winemaking process, so it would be difficult to find a wine with absolutely no sulfur. It can provide some useful benefits, but is also been used excessively at times by winemakers to cover all kinds of flaws. Using too much can kind of dull the taste of the wine and overuse can even cause off flavors. You might get a smell like a struck match for example. Most winemakers in these camps will seek to limit their usage, and it is actually restricted in certified organic wines, as mentioned above. Lapierre puts a "N" on the back of bottles made without added sulfites. See my recent post on this Morgon for a delicious pairing. That’s A LOT. This is already enough to make make your brain explode! 🤯 Sadly, we’re not stopping here since there are a lot of blurred lines. Many more wines fall into grey areas than those clearly defined in black and white. I don’t blame you if you want to tap out here though. Things get even more confusing when you consider that certifications are really expensive; way too expensive for many small producers. A lot of these little guys operate according to one or more of the principles outlined, but they just opt to not pay for the certifications. Others choose not to get the certifications for a slew of other reasons. Some have concerns about being labeled a “natural wine” because there are negative connotations associated with the term for some groups, just as it has positive connotations for others. Given that many choose not to certify for different reasons, you might see/hear the term “practicing” in front of organic, biodynamic, or sustainable. Growers might also be certified in one area, while also practicing others without being certified. For example, the Arianna Occhipinti SP68 I recently featured is certified organic and practicing biodynamic. As well, the Lapierre Morgon was a leader in the natural wine movement from very early on, then later got its organic certification by Ecocert. According to one source, Marcel Lapierre also started experimenting with biodynamic practices from as early as 2003, and his kids have been moving increasingly in that direction; but they’re not certified in this area. Finally, the Avis d'Blanc Frais from Mireille and Pierre Mann checks most of the boxes and has all the certifications on the label, as shown in the picture at the top. The Mas des Caprices Avis d’Blanc Frais 2018 is a blend of of Maccabeu and Grenache Blanc from Southern France. They’ve got all the certs! It’s round with notes of white flowers and a hint of sea spray and made a wonderful pairing with takeout sushi. I am by no means a purist on these matters. I don’t think there’s one silver bullet method. I’ve heard quality conscious winemakers speak on many sides of these issues–it can get really nuanced. For example, I’ve heard growers in certain areas say that, to their mind, the requirements of organic or biodynamic certification actually don’t make sense for there particular region or site. A case in point is the problem of copper sprays which are used as fungicides. These sprays (the most well known of which is probably Bordeaux mixture––copper sulfate plus lime) are in fact approved for organic use in many places, and to a lesser degree in biodynamic farming. However, they can end up causing more environmental harm than some synthetic fungicides that are not allowed in organic farming. If you’re a grower in a region prone to fungal issues (if there’s a lot of humidity, for example), you might reasonably conclude that a judicious and limited application of another synthetic fungicide is the more environmentally friendly option. Another factor to throw into the equation is that it’s much easier to farm organically/biodynamically in certain region than others. Drier regions like Alsace have a much easier road to farming through these methods than Bordeaux for example, where rainier weather puts their vines more at risk for fungal diseases. We also have to take into account that this is a business. Imagine you’re a grower who needs the money from your crop to feed your family and some fungal disease comes into your vineyard threatening your livelihood. Yes, I can completely understand how you might make the choice to use a fungicide. Of course, if you’re certified and choose to do so, you lose that really expensive certification. These aren’t easy choices. I’m also personally not against the use of a little bit of sulfur either. Sulfur is naturally occurring, and as mentioned, it offers anti-bacterial protection that can prevent off flavors from developing and keep a wine stable. It’s been compared to penicillin for wines, and I think that's right on. Penicillin (and antibiotics in general) were overused for many years. We’ve been scaling them back, but that doesn’t mean they don’t have a ton of value when used in a smart and precise way. Similarly, I don’t think sulfur should just be dumped into a wine to mask flaws, but I don’t mind if a little has been used to help ensure a wine remains sound. Some people link sulfites in wine to headaches, but there really isn’t any medical evidence to support this. Sulfite allergies are real, but they’re not specifically connected with headaches. (For thoughts on what might be causing your wine headaches see this article on VinePair.) That said, if you sense that avoiding them makes you feel better, by all means do what’s right for you. While I don’t take a hardline on which methods I think are best, I do like to see environmentally conscious methods being practiced in creating the wines I buy. I’d also prefer to have wines that aren’t pumped full of tons of chemicals, so I try to be somewhat conscientious about what I buy. I try to do the best I can without making myself crazy. I would say that the majority (but certainly not all) of the wines I’ve shared on this blog fall somewhere into one of the camps laid out above. Podere Selva Capuzza, in Lugana, Italy, doesn't adhere to one particular methodology in their vineyard practices. They do, however, take sustainability and environmental impact very seriously and lay out their beliefs and practices on their website. I also want my wines to taste good. Being natural/biodynamic/organic doesn’t automatically guarantee that. I’ve had bad wines from these camps just like any other. It’s really easy to let some really off, funky flavors get into wines when you’re not careful and not using any preservatives, etc. That said, there's also something to be said for evolving tastes and a lot of the funkiest of wines are attracting a growing audience. Nonetheles, to my mind, a lot of flaws are excused under the guise of natural wine. At this point, my palate has a pretty high tolerance for funk, but IMHO, there are definitely wines out there that go too far! On the other hand, I will also say that when I try a wine that tastes really energetic, vibrant, and alive, more often than not, when I look into it further I find the wine falls into one of these camps. When made with care and attention to detail, these wines tend to really shine. Given that these terms can be so confusing, how do you know which wines are which? How do you find them without giving up in exasperation? You could rely on finding the logos for the various certifications on the bottle. That’s definitely reliable when they are available, but as previously noted, that rules out a lot of really great producers who just haven’t certified. There are some additional tricks to find quality wines that might fall into these camps. Having a wine shop you trust, for one, can be really useful in steering you in the direction of wines from some of these smaller producer that can’t afford the certifications. In Oakland, we’re very lucky to have several shops and bars that feature wines in these categories to varying degrees. Bay Grape, where I work, focuses on small producers using sustainable methods in some form. Other nearby options include Ordianaire and The Punchdown, each focusing more specifically on natural wines. Ordinaire’s owner even spearheads Brumaire, a natural wine fest, each year. When we were first starting out, we quickly became disappointed with the lack of good natural wine in the $20 range. Not being the kind of people to say ‘well, it is what it is’, we got to work thinking about how we could remedy this situation. So, we started talking with our producers and, already knowing what we wanted - native yeast fermentations, low or zero SO2 additions, and the like; basically pure unadulterated glou glou that we could put into a liter-sized screw-top bottle and would be a great introduction to natural wine - it didn’t take long for us to find winemakers who were willing to partner with us on this project. 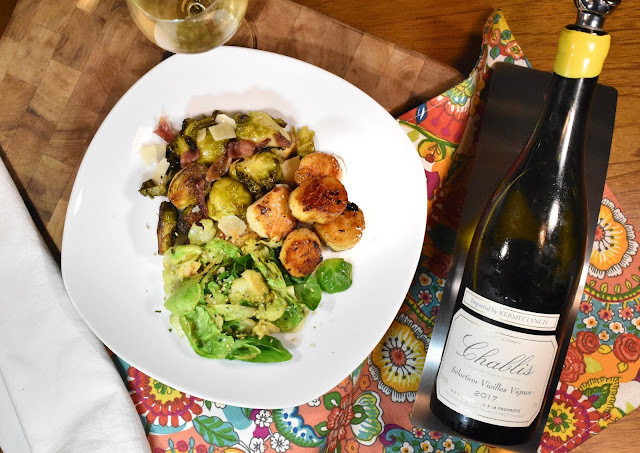 Since this site is all about the intersection of food and wine, I couldn’t put up this post without leaving you with one more pairing–especially after so much dizzying information. 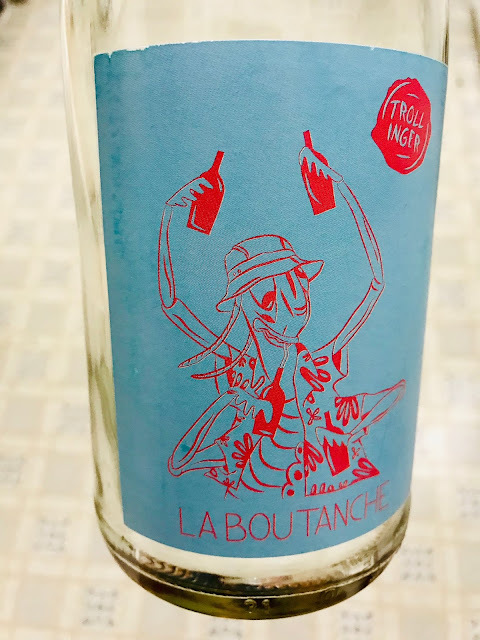 So, I grabbed a bottle of La Boutanche Trollinger 2017 to share with you. This wine is the work of a young Austrian winemaker named Andi Knauss. He’s in his early thirties now and always knew he wanted to be vigneron. His wines tap into a lot of topics dealt with here today. He works organically in the vineyards, makes his wines using natural fermentations with minimal sulfur in general and none at all for some cuvées. We enjoyed the light, juicy, refreshing bottle of Trollinger with salmon and roasted veggies. In my last post we took a virtual trip to Sicily through a conversation with my friend Sarah H. Bray, who has spent a lot of time working in Sicily, among other places. Now we continue the exploration by narrowing in and looking more closely at Mount Etna. As Sarah is a US Brand Ambassador for Passopisciaro, we’ll get to know their winery, wines, and their relationship with the fascinating terroir on top of this volcano. Passopisciaro’s wines have always impressed me, so I was excited to talk to Sarah more about them and get know their backstory better. This winery is all about Nerello Mascalese, which is native to Mount Etna. This grape tends to show red fruit flavors with herbal and floral notes,as well as light hints of spice. It tends to be medium bodied with fresh acidity. Nerello Mascalese is also known for being really able to reflect its terroir. Passopisciaro really showcases this aspect of the grape with six different bottlings from different sites on Mount Etna. Sarah told me that owner Andrea Franchetti seeks to show textural complexity in his wines. “He favors late picking in order to soften the phenolics of these highly tannic varieties,” creating polished wines. The wines are fermented in stainless steel vats, followed by malolactic fermentation and 18 months of aging in large neutral barrels. Since they use no new oak, that polish has to come from the quality of the fruit from the start. Andrea also believes in racking the wines when needed. Getting that oxygen in the wine allows for more expressive fruit and less rustic tannins when the wine are young. Other than this, intervention is kept to a minimum so as to allow the differences in the terroir to really shine through. Farming in Passopisciaro’s vineyards follows sustainable practices. They generally take a lutte raisonnée approach (basically only intervening when really necessary) and only use organic materials for treatments. They also borrow certain practices from biodynamic methods, following the moon cycles, but don’t the preparations. In addition to the six Nerello Mascalese wines, Passopisciaro also makes a Passobianco from Chardonnay, and their top-end Franchetti cuvée which is a blend of Petit Verdot and Cesanese d’Affile. Now that we have this primer on the winery out of the way, let’s jump back into the conversation with Sarah. My understanding is that Andrea Franchetti did quite a lot both to revive the winery and the vineyards when he purchased the property. What was that process like and were there and surprises along the way? He tells the story about how, after founding Tenuta di Trinoro, he was looking to start a new project in Sicily. Driving around the island, he thought it was too warm overall, but someone pointed up to the black mountain in the skyline, and he set off (I’m assuming at break-neck speed; he’s quite the fast driver!) Ascending, he stuck his arm out the window – this would have been around Easter time – and the air was substantially cooler. He then came upon these collapsed terraces across the volcano with these gnarly old vines planted on them. He ended up acquiring several parcels across the northern side of the volcano at different elevations, from 1,800-3,300 feet above sea level, and released his first vintage of Passopisciaro in 2001. There really was no winery before him. There was a building with a caved in roof that he had to restore; the previous owner had abandoned the building when the lava flow of 1947 came within meters of it. In the vineyards, about 60 acres purchased in non-contiguous sites, there was much work to restore crumbling, overgrown terraces and bring these 70 to 100 year old-vines he’d purchased back to production. Meanwhile, he was experimenting with winemaking styles for this “vinello,” or little wine as he called the Nerello Mascalese grape; his winemaking experience previously had been with the Bordeaux varieties, so initially he used barriques to age the wines, but evolved to using neutral oak after the first several years when he saw that the wood overpowered the variety. As an outsider to Etna, he was also interested in trialling different varieties and what they could express about the terroir, so he planted additional vineyards of Chardonnay, Petit Verdot, and Cesanese d’Affile on the main estate in the contrada of Guardiola. I love that image of him racing up Mount Etna. It’s like he’s chasing the terroir! There must be some real challenges to working on an active volcano. Give us some insight into what that’s like? You think active volcano, and of course, there is the constant, very real threat of eruptions. Etna is a composite volcano, meaning that pressure can build and release at any point on its surface, not just from the summit craters that loom at 11,000 feet above. The aftershocks of eruptions are also a challenge; the eruption that occurred after Christmas last year caused more damage through the earthquakes (mostly on the eastern side) than any lava did. There is also the very fact of how hard these vineyards are to work. The traditional planting method is a bush-trained “alberello” (little tree) on terraces of varying widths that ascend in altitude very quickly, requiring manual labor at every stage of the growing cycle, but in soils that are like walking on the moon. It’s really laborious to move through the vineyard just walking – think about carrying equipment or crates of grapes! Winter pruning on terraced vineyards of Mt.Etna. 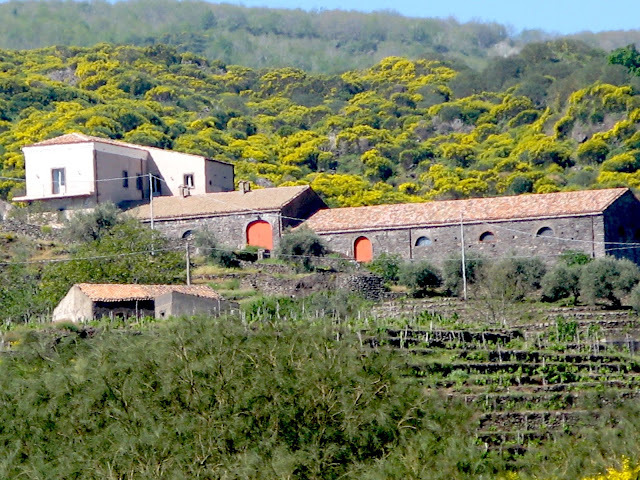 For more on what it’s like to make wine on Mount Etna, see this detailed section on the Passopisciaro site. Everything about this seems so precarious! 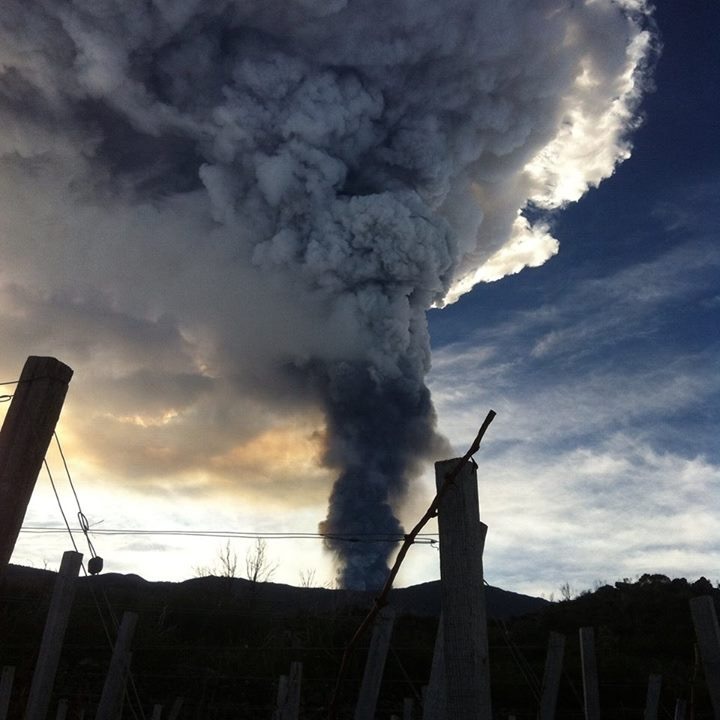 However, the upside seems to be that the volcano creates really distinctive terroirs and these are now being classified. Passopisciaro has been at the front of establishing this cru system on Etna, known. Give us a brief overview of how it’s organized. How do you see that evolving? The Contrada system on Etna leverages existing territorial names on the volcano. If you grew up there and told another local, meet me in Contrada Rovitello, that person would know instinctively where to go. In fact, Passopisciaro’s address just reads Contrada Guardiola -– mail and delivery guys know where to go, but it’s a bit more difficult for clients to find us the first time they visit! These names roughly correspond with changes in elevation and lava spills and thus have been appropriated as names for the growing zones, which are quite distinct from one another. Some change as the lava flows occur: San Lorenzo was originally called Bocca Dolce, but the 1981 lava flow ate up several hectares, so the name was changed for the remaining territory; Sciaranuova, which literally means “new lava flow” in Sicilian dialect, is a small cru that corresponds to a flow from the 1600s that was planted in the 1800s (it takes about two hundred years for new lava to become friable enough to plant). It’s also important to understand that every lava flow is made of a different mineral and soil composition, and over time, areas have been exposed to different elements. Sometimes, side by side sites are visibly different. 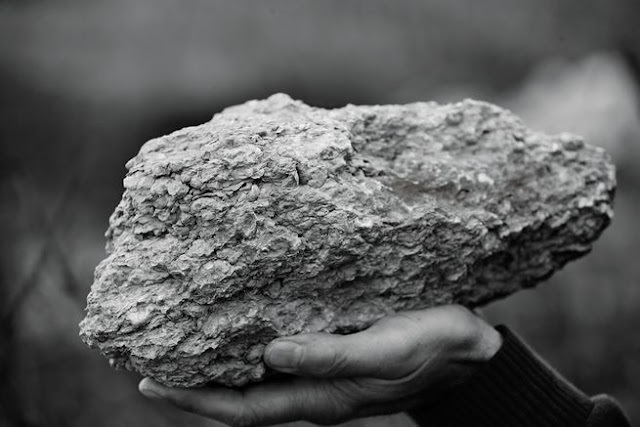 In our Porcaria vineyard, which is part of the larger area Feudo di Mezzo, there once ran a river, so the pumice stones are much more worn down; Chiappemacine, instead, is at a lower elevation where a lava spill actually encountered limestone, and there’s a mix of these soils in parts of the vineyard making the soils lighter in color in some of the terraces. Elevation also has a huge impact, as ripening occurs at different times and climatic conditions can be quite different between 1,800 and 3,300 feet. The real question about the evolution of this system lies in whether or not the DOC production zone will be expanded, which is not really on the front burner at the moment. Some Contrade lie within the DOC, some do not. 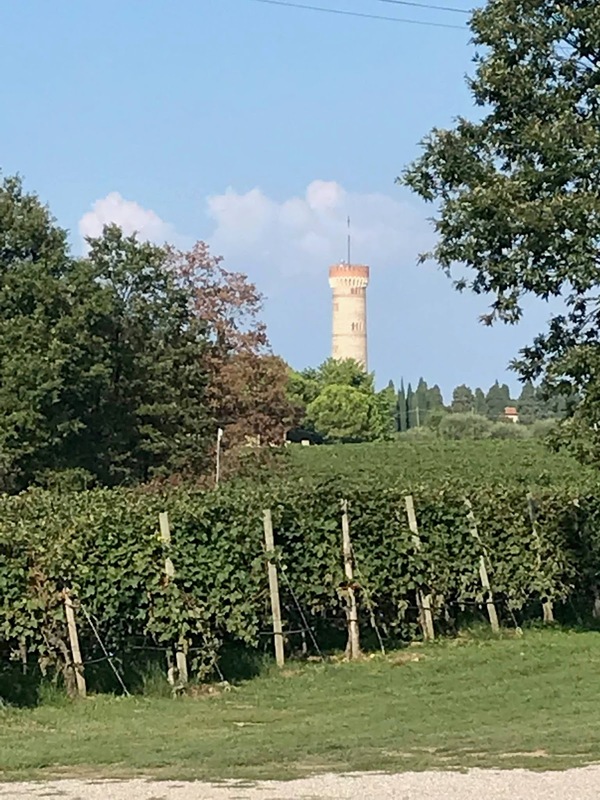 Contrada Guardiola is split in half, with the upper confines of the DOC corresponding to the road that leads to our winery, which sits just above the road, as in just above the DOC line. Some of our vineyards are above, some below. Lots of the higher elevation sites on the northern face of the volcano are being used to make wines (really great ones, in fact), but they cannot be called Etna Rosso’s. While Marco de Grazia was the first to put these names on his labels and begin to talk about the sites in terms of Grand and Premier Crus, Andrea had the idea to start an event called Le Contrade dell’Etna in 2008, where he invited other producers to his estate to bring samples of the most recent vintage and taste through these young nerellos from the different territories. He also invited some international trade and media, and that event really helped propel the region, and the concept of these cru sites, onto the world stage. The next edition of this event will take place on April 14 & 15. For more info on Sicily’s terroir see this article Sarah wrote for SevenFifty Daily. If I ever get to go to Sicily, I’ll have to plan my trip around Le Contrade dell’Etna. Seems like it’d be the perfect way to taste through and understand the terroir. Now let’s add grapes into the mix. Passopisciaro focuses largely on Nerello Mascalese, with six of its eight wines coming from this grape. What’s is so captivating about it? How does it transmit the various terroirs? I could talk about Nerello Mascalese all day, every day. I think it is a grape that produces wines that are compelling, complex, and simply delicious. For someone encountering the grape for the first time, I talk about it like a lovechild of pinot noir and nebbiolo, since it has the tannic structure of the latter and the red fruit character of the former, with its own obvious distinct mineral and herbal characteristics (For the record, genetically, it’s not; according to Ian d’Agata’s Native Wine Grapes of Italy, it’s a natural crossing of Sangiovese and Mantonico Bianco). In terms of transmission of terroir, Nerello Mascalese is an extremely transparent grape. Images of Nerello Mascalese grapes and vines. Photo courtesy of Sarah H. Bray. 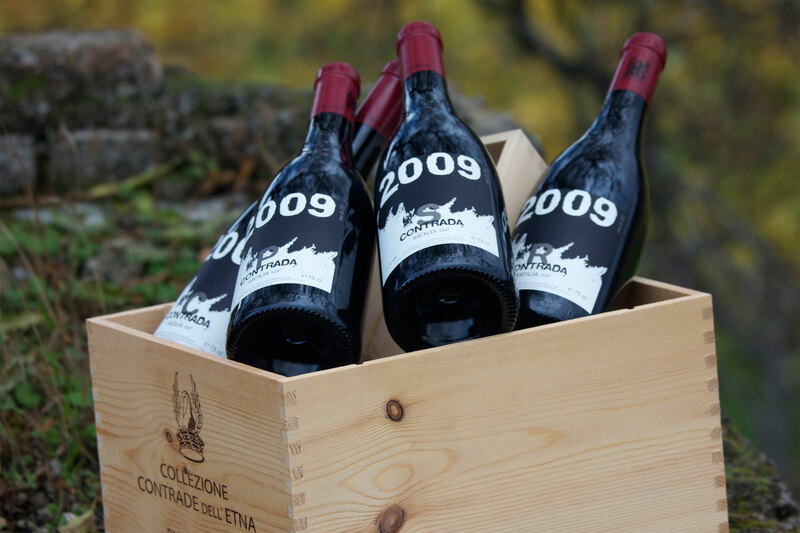 The red wine of Etna is of nerello mascalese, an ancient grape, rare except on this volcano, where it is still splendidly cultivated like a mountain grape in old and ancient bush vines. It has little color, large bunches with strong, thick skins, and it ripens late – for the vines planted at 800 meters and above, as late as November. The light red color of the wine is from the variety, not from dilution; the berry is large, and instead of using the bitter skins, the wine is made from the juice, which is best when plants are not too stressed. During fermentation, the nerello has notes of marzipan and a boorish, carnal quality, which are so pagan that the embarrassed winemakers let it fade; often, there’s a hint of nail polish when the yeasts are disturbed, but in every other sense, the fermentations on Etna happen easily because of the lack of pesticides, up to now, on the mountain. Notes of citrus and camphor come into the wine from the lava flows, and an aromatic acidity gives the impression of a sort of reddened white. When well made, nerello mascalese improves over eight years, then begins to age slowly, gaining hints of a sweet smokiness. Now that we’ve learned so much about the wines, let’s turn to how to enjoy them. What are some of your favorite pairings for some of Passopisciaro’s wines? Passobianco, the only white wine we make, is a delicious aperitivo wine, but I recently had it with a pasta dish over a fava cream, which was an absolutely delicious complement. The Nerello Mascalese wines, from Passorosso to the five Contrada wines, can pair with fish as easily as pork both of which are readily available on a mountain that is located in the Mediterranean; they’re also great Thanksgiving wines, given that they can handle everything from the tartness of cranberry sauce to the richness of gravy. This glosses over the nuances of the five single vineyard wines, which generally are richer from the lower sites (Contrada C and P), structured from Contrada G, and lighter, more acidic, and almost ethereal from the higher elevation sites (S and R); when I have the option of showing them together, I course them according to body. The Franchetti wine we make, made of Petit Verdot and Cesanese d’Affile, are great with meat dishes like barbecue and steak au poivre; I’ve also had them at the end of meals with simple desserts, given the richness of the black fruit that comes out in the wine with some bottle age. Once again, you’ve given us some amazing suggestions. Fava cream, steak au poivre, and everything in between – it all sounds delicious. I’ll get my hands on a bottle soon to do some experimenting. Thanks for all the ideas and info Sarah! 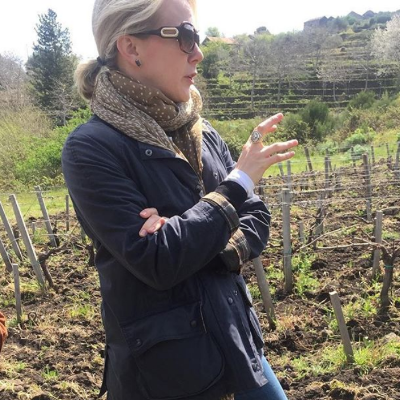 Sarah H. Bray in Passopisciaro's vineyard on Mt Etna. All photos courtesy of Vini Franchetti unless otherwise indicated. Sarah is one my collaborators on Bâtonnage Forum and will be here in Oakland at Bay Grape on 4/28/19 as part of our Women in Wine Discussion Series leading up to the event. Find more details here. All profits from ticket sales go to creating scholarships for minority women attending the Bâtonnage Forum! You can also still get tickets to Bâtonnage as well. It's happening on 5/4 – just one month away! – in Napa.